As a wedding planner in Chicago, I have seen hundreds of beautiful, touching, romantic and fun wedding ceremonies. One of the most stunning ceremonies for me in the last few years was that of Katrina DeGraff and Dominic Cairo at the University Club of Chicago on September 11. 2010. As a young girl, Katrina participated in a local children’s choir. In order to recreate those very special memories we brought in 40 young adults from the Anema Singers located in Glen Elyn, IL. Serenading the bride with songs from childhood as she walked down the aisle – the happy tears were flowing before the ceremony even started! 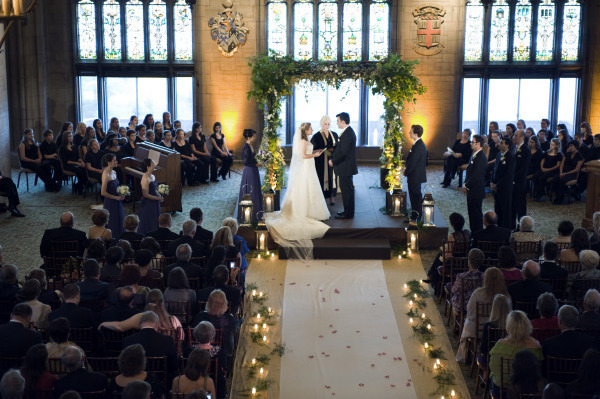 Cathedral Hall and a beautiful canopy created of branches, ivy, suspended candlelight and lanterns was the perfect majestic backdrop for this timelessly elegant exchage of vows. The bride and groom had a coat of arms designed for their reception details and had it letterpressed into their invitations and menus and designed in chocolate on their gorgeous wedding cake. Other layers of the cake were designed to resemble the intricate designs on the bride’s engagement ring. The overall feel was a sophisticated yet organic “Princess Bride” vision in shades of plums, lavender and green.